We heard there'd be a little something different at this year's MDGSP event: pheasant on the ground for the Master Hunt Test dogs. Better than a cup of coffee: a handler in the first brace flushes up a rooster in front his dog and a gunner on the Master course. Very next point, it's another pheasant. The handler's watching his dog as the nearest gunner works on the bird. 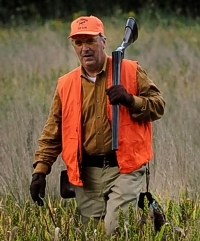 Pat drops a flushing pheasant like a stone. The previous bird can be seen hanging from his hip. Pat wades through the grass back to the gunner's station, two pheasants on board. That shotgun over his shoulder is breached, which allows anyone in the field to see that it's safe. This rooster was bumped up by a hunting dog, and shots were pulled. He was last seen headed over the tree line with a tailwind helping him along. Dan keeps an eye on the steady Shorthair he's handling as a quail flushes up from the cover. The Weimaraner's watching that chukar launch, but he stays put. The angles are deceptive from the gallery - but one gunner has a safe shot, and the other does not. The most important thing a gunner does is choose not to raise that gun. 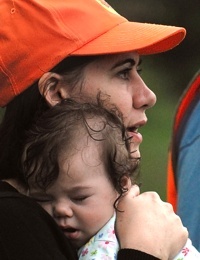 Cackling roosters, barking dogs, distant shotguns, clomping horses - nope, it just doesn't matter yet to this future junior handler having a nap in the gallery. A classic hunt test gunning configuration. And no, nobody in the gallery caught any pellets. 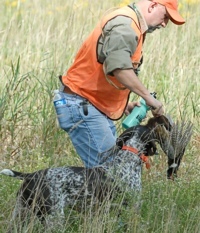 A shorthair delivers a pheasant to his handler, and will get a nice mouthful of water to wash out those smaller feathers. Good boy! The shorthair is steady, closer to the feet of the left-hand gunner, and the handler has just kicked up a quail in front of the other. And the gunner with the better shot provides the dog with his retrieve. The senior/master test judges leave the bird field and head to the line to meet the next pair of handlers. 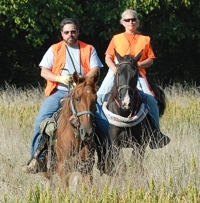 Two handlers trail their dogs into the bird field. A nice point! Handler and gunner walk in to work the bird. And a nice retrieve! Out of some thick cover, and right to hand. A Weimaraner and a Pointer bump up a chukar while quartering the field. Both stopped to flush. 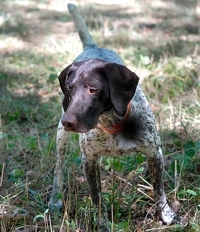 In a senior test, judges may tell the backing dog's handler to crouch with the dog and keep it steady while the other handler flushes up a bird. Here, that other handler's reminding his dog to stay put as that bird rises. And the backing dog is kept collared through the other dog's retrieve. A chukar jumps up right in front of a handler and gunner. Sometimes things can play out immediately in front of the judges. Clearing a row of milo. A little artistic license with a GSP shot that suffered from distance. He's just stopped to flush. 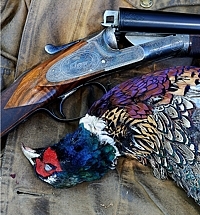 A moment on the sideline near the gunner's station to shoot a classic upland still life. On the junior course, a Pointer and a Gordon Setter break away. As they approach the bird field, the brace has separated a bit. One judge stays with each handler. 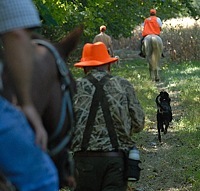 The junior test's back course takes the dogs along a woodline, past crop rows, and through lots of stimulating cover. By mid-day, the sun was intense and dogs were getting hot. This Pointer's not discouraged at all, but will have a harder time scenting in the heat. In weather that hot, the shade is a much more comfortable place to lock up on a bird. Another view - this pup's not moving a muscle. Another cool customer on a hot day.